Last week in our office, a 3D printed invitation was created for a fundraising event! What ever happened to paper? The Internet is abuzz with tales of the latest incarnations of 3D printing technology, 3D printing services, Kickstarter projects and human interest stories that have found ingenious ways of utilising the technology. Architecture and design practices everywhere need to get ready for this new technology that is going to be as revolutionary as 3D CAD and plotting first was in the early 80’s. And it’s already happening. The path to 3D printing hasn’t been overnight with some of the earliest mentions of the technology going as far back as 1981. With current advances in technology, costs have now dipped below the more consumer friendly threshold of $2000 with one Kickstarter project, the Buccaneer promising to deliver a 3D printer for $347 that uses cloud based, mobile device friendly software. A 3D printed bia-absorbable splint that saved a babies fatal impaired breathing. A 3D printed ear that printed 3D cells and nanoparticles and combined them with a small coil antenna and cartilage. 3D Chocolate Printer for those with a designer sweet tooth. 3D printed sugar cubes because we’ve all seen lumps before. 3D printed Buritos because you can. 3D printed shoes where form truly follows function. 3D printed dress where form follows va va voom! 3D printing with the mind using the EPOC emotiv neoro-technology headset. 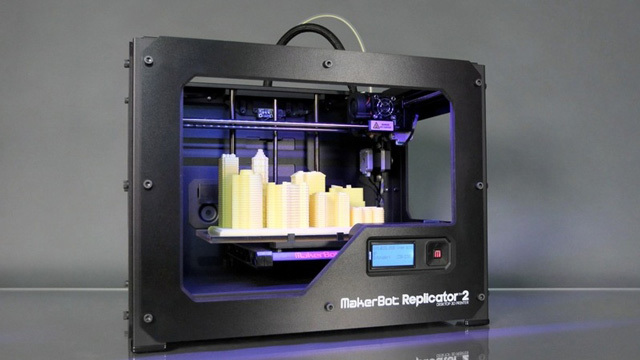 Manufacturers from around the world like Makerbot, Stratasys, 3D Systems, and Formlabs are all coming up with variants of 3D printers, that can be used to create objects (depending on the technology) using a range of materials such as flexible plastic, alumide, stainless steel, sterling silver, sandstone, wire and ceramics. Companies like Shapeways and 3D print offer printing services a variety of these materials and finishes. One company, Filabot even offers a machine that allows you to recycle your old ABS plastic into filament that can be used by a 3D printer. The software range keeps getting better with a range of systems like TinkerCAD and 3Dtin allowing user friendly creation of 3d models. Including one app called 123D that allows you to stich together a 3D model using photos from your smartphone. Brilliant! Perhaps one of the most intriguing directions of all of this 3D printing technology, is the ability for machines to create or replicate themselves. At one end is nanorobotics and at the other machines like Rep Rap which is an open source project that self-replicates by making a kit of parts that can be used to create another version of itself. So where will this all end up? Only time will tell. All we intuitively know now is that the inherent capabilities of this technology will lead to a whole range of possibilities for the Architecture, design and construction industry for uses such as study models, prototype parts and bespoke furnishings. Have a look at the fantastic video here about how Rietveld Architects in New York are using 3D printing technology.